Did Harlindis and Relindis actually write the Codex Eyckensis? Saint Willibrord’s missionary efforts in the Maasland region proved quite successful. In the year 721, Adelard, Lord of Denain, built a wooden church and a convent for his daughters Harlindis and Relindis. Adelard and his wife Grinuara had their daughters brought up at the Benedictine monastery in Valenciennes. With their keen minds the girls remembered everything they were taught about Christianity and Latin, but also about weaving and embroidery and they even became skilled at writing and painting—according to their biographer, writing about a century later. To which he added that these skills were “things which in this day and age would even be quite a feat for sturdy men.” Not an unreasonable remark, given that at the time most people would simply never learn to read or write at all. Adelard spent quite some time looking all over his estates for a suitable location to build the convent. Eventually he decided on a site near a clear spring “in a small and useless wood”, situated about one mile from the river Meuse. This is where the convent would be built, after the surrounding lands had been cleared of all traces of heathen superstition. The local people set to work, aided by Harlindis and Relindis themselves, who “carried sand and stone in their arms” to the construction site . In Eyke, Harlindis and Relindis lived together with their parents and a small group of religious women. They followed the Rule of Saint Benedict, like Willibrord himself. As soon as there were twelve people in the religious community, it obtained monastic status. Harlindis and Relindis received regular visits from the indefatigable missionary Willibrord and later also from Boniface. It was Willibrord himself who consecrated Harlindis to become the first abbess of the convent. 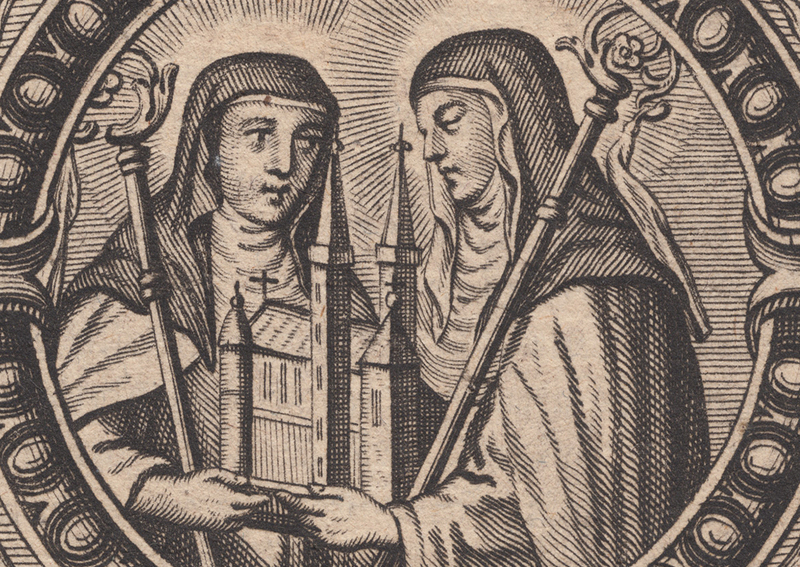 After her demise, Boniface consecrated Relindis as her sister’s successor. The sisters both fitted perfectly in the world of religious women around the two missionaries. C.H. Talbot (1954) described the remarkable and prominent role women played in this intellectual renaissance. Numerous communities in Britain and Ireland were led by highly educated abbesses. A letter has been preserved, from Boniface to abbess Eadburga of Thanet, in which he asks her to make him a copy of the Epistles of St Paul in letters of gold. The biography of Harlindis and Relindis makes mention of their having written an evangelistary, a psalter and various other religious books, for the education of their fellow sisters. The Codex Eyckensis itself, however, provides refuting information. The last lines of the manuscript are: Finito volumine deposco ut quicumque ista legerint pro laboratore huius operis depraecentur. 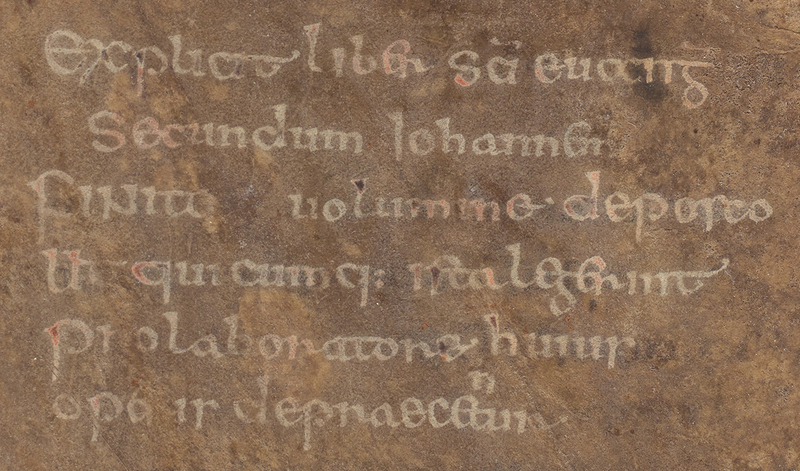 This means: “At the completion of this volume, I ask all who read this to pray for the worker who made this manuscript.” The use of the male form laborator (“worker”) clearly indicates that the person who wrote the manuscript was a man—in all likelihood a monk working in the scriptorium at the abbey Willibrord had founded in Echternach. Since the year 1100 Saint Willibrord is venerated in Echternach with a special procession held on Whit Tuesday: the dancing or hopping procession. Participants hop from left to right to a traditional polka-like tune. Every year some 13,000 pilgrims travel to Echternach to take part in the festive procession. In 2010 the hopping procession was inscribed on the Representative List of the Intangible Cultural Heritage of Humanity by the UNESCO. Harlindis and Relindis were canonised in the ninth century. On this occasion, someone wrote down their life story and the bishop of Liège commissioned the building of a stone church to replace the wooden church at Eyke.. The sarcophagi of the two saintly sisters were moved to the new church. The stone church had separate entrances for the nuns and for the faithful, which meant that worshippers from the surrounding area could now pay regular visits to the church to venerate “their” saints and also the valuable objects they had left behind: ornately decorated textiles and illuminated manuscripts. In this way the two parts of the Codex Eyckensis became sacred objects, but from that time undoubtedly also served to make the local community acquainted with the Gospel texts. The veneration of Saints Harlindis and Relindis became widespread throughout the diocese of Liège. In 1388 the first procession was held, with the relics of Harlindis and Relindis being carried from Aldeneik to Maaseik and back and thus displayed to the general populace. In this way the visual contact between the worshippers and the relics was no longer restricted to the church building itself. This annual procession was later replaced by a septennial procession. In 1571, for safety reasons the relics and religious objects were solemnly translated to Saint Catherine’s church in the walled town of Maaseik. After the anti-religious French Revolution, the tradition of the festive procession was reinstated in 1871. From then on it was held at 25-year intervals. The next procession is planned for the year 2022.